Apostle spoon sets comprise the twelve Apostles and the Saviour. The earliest is dated to 1493, though they were most popular from 1500 to the 1660's. They were often given as christening gifts. The wealthy might give a complete set, whereas the less affluent would give a single spoon, perhaps picking the Saint after which the child had been named. 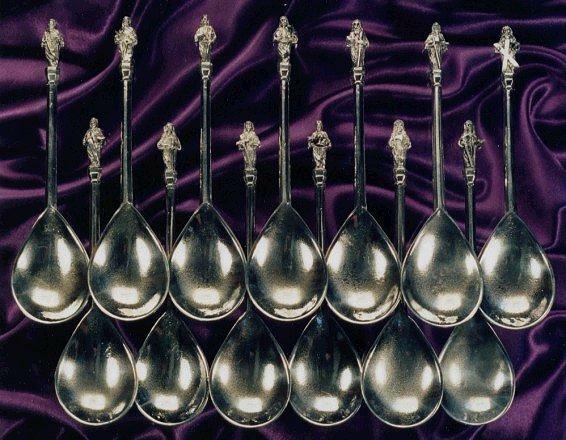 Silver spoons were generally much sought after as a sign of wealth, and whatever was popular in silver was soon copied in pewter, so that even the less well-to-do could enjoy some measure of style. Only four complete original sets are known to exist. These spoons are supplied loose, not boxed. They measure 6.5 inches, 17cm long.